Modi and Trump didn’t talk about visas at White House meeting. 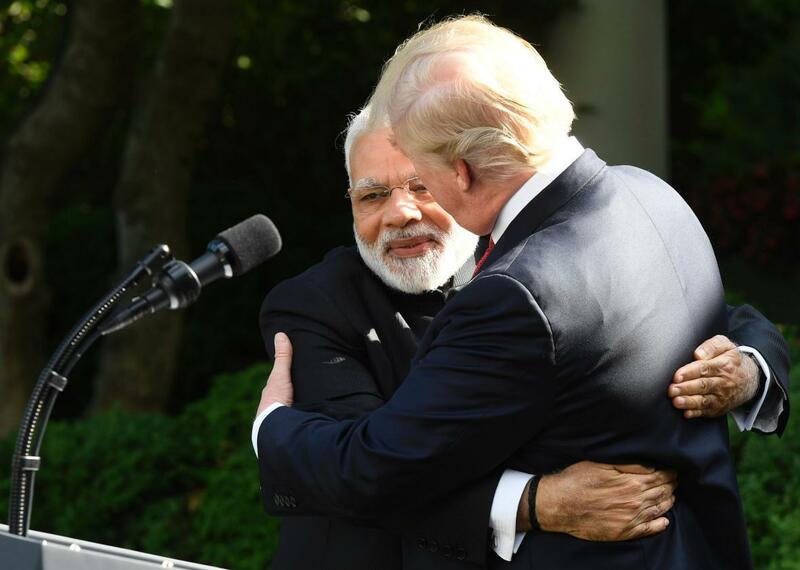 President Donald Trump and Indian Prime Minister Narendra Modi hug after speaking in the Rose Garden of the White House on Monday. According to Donald Trump and Indian Prime Minister Narendra Modi, the first visit between the two leaders was a huge success. “The relationship between India and the United States has never been stronger, never been better,” Trump said after their meeting on Monday. Modi tweeted that he was “delighted” to meet Trump and looked forward to welcoming him in India for the 2018 Global Entrepreneurship Summit. The two leaders also issued a joint statement shortly after their meeting, affirming their commitment to work together to defeat global terrorism and strengthen trade ties. Indian media, however, was not too happy with their prime minister, who, according to reports, did not bring up Trump’s possible restrictions on H1-B visas—an issue that before the visit was expected to cause friction. Indian media noticed that he didn’t. Livemint, an Indian online magazine, wrote that the issue confronting Indian professionals and outsourcing firms should have been an integral part of the talks on Monday. With the Trump administration undertaking a review of the H1B visa, the most sought-after by Indian IT professionals, the issue had taken centrestage ahead of Modi’s US visit with the issue expected to figure prominently in bilateral discussions. However, the H1B issue specifically did not figure in the talks, with foreign secretary S. Jaishankar telling reporters that there was a lot of discussion with business leaders and the two leaders about the digital partnership when asked about whether H1B visa issue figured in the talks. “There is recognition that the Indian-American community has played an extraordinary role in building this relationship. When you value something it is obvious that you will take care of what you value,” Jaishankar said. The H1-B visa allows American companies to temporarily hire foreign workers in specialized fields like technology, science, and finance. In order to obtain the visa, applicants have to undergo a substantive process and meet high standards of specialized knowledge and education. The U.S. currently grants 85,000 H1-B visas every year and, according to the United States Citizenship and Immigration Services, the number of applications can be up to three times more than this number. A 2015 report to Congress from U.S. Citizenship and Immigration Services noted that Indians were the top beneficiaries of the H1-B policy. According to the report, 220,286 Indians were successful in obtaining the work visa in fiscal year 2014. A list in the New York Times of the 13 global outsourcing companies that won one-third of all H1-B visas granted in 2014 included seven Indian outsourcing firms. Indeed, the country’s outsourcing industry is valued at a staggering $150 billion. This is expected to take a hit under the Trump administration. In April, Trump signed the “Buy and Hire American” executive order, calling for a multiagency report, including Labor and State, to recommend changes to the H1-B program by November. Ahead of signing the order, the president spoke at a rally of workers in Wisconsin. “Right now, widespread abuse in our immigration system is allowing American workers from all backgrounds to be replaced by workers brought in from other countries to fill the same job, for, sometimes, less pay.” While the report is still underway, McKinsey India reported in May that at least 200,000 software engineers in India will lose their jobs each year over the next three years due to denial of H1-B visas.